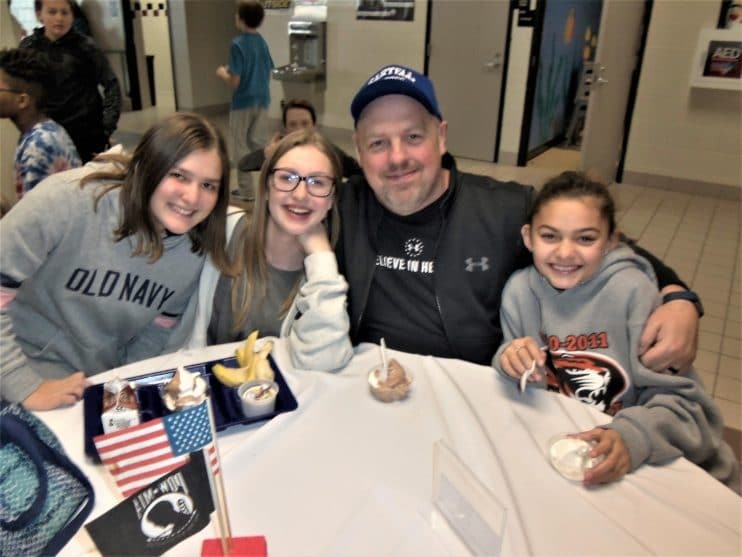 The crowded cafeteria at Sartell Middle School was a buzz and roar of conversation Nov. 9 as students and their military veteran relatives enjoyed lunch together. It was the annual SMS “Lunch with Veterans” event, in honor of veterans and Veterans Day, and this year the luncheon accommodated 75 veterans and their young loved ones and friends. SMS Academics Extension Coordinator Lori Dornburg said she was pleasantly surprised at the turnout. Originally, 40 veterans signed up, but in the last day or two, 35 more signed up. At one of the many lunch tables sat Lucas Jones, 44, of Sartell, who served nearly 10 years in the Minnesota National Guard. Also at the table was his daughter, Liberty Jones, SMS seventh-grader. Several of her friends also joined the conversation – Allie Hubert and Brodi Pflueger, both Sartell seventh-graders. Jones is a forklift driver for Big Rock Sports in Sauk Rapids. Liberty’s friends nodded their heads in agreement. Near the Jones’ lunch table was Norbert Olson in a wheelchair looking up at a wall exhibit filled with photos of veterans related to SMS students. One of the photos was of Olson, taken when he was a U.S. Navy sailor 74 years ago during World War II when he served in the Pacific, mainly in the Philippines. 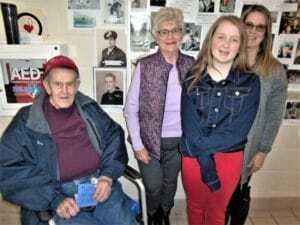 Raised in Faribault, Olson, now 92, and his wife Bette now live in Alexandria and came to SMS to have lunch with their granddaughter, Audrey Olson-Drake, an eighth-grader. She is the daughter of Nancy Olson-Drake and Steve Drake of Sartell, Nancy being the daughter of Norbert and Bette. She is also the mother of Evan, a fourth-grader in the Sartell-St. Stephen School District. “My grandfather is a very brave person,” said Audrey, who would later sing in the choir for the school’s “Tribute to Veterans” assembly program. For many decades, Norbert Olson was an executive for the Boy Scouts program councils in Minnesota, South Dakota and Iowa. Granddaughter Audrey is a Girl Scout, mother Nancy noted. One of the highlights of Olson’s life, he said, was being asked to fly to Washington, D.C., on an Honor Flight to view the World War II Memorial. That flight in 2010 was made possible by the St. Cloud VFW Club. Norbert and Betty Olson said they were happy and honored to be part of the SMS veterans’ salute and happy to spend some time with their daughter, son-in-law, granddaughter and grandson. After all the lunches were served, many participants attended one of two tribute assemblies in the gymnasium with music, speeches and guest speakers. At the Sartell Middle School’s Lunch with Veterans Day, Norbert Olson, 92, gathers with wife Bette, daughter Nancy Olson-Drake (right) and granddaughter Audrey Olson-Drake, an eighth-grader. The lowest photo between Norbert and Bette is of Norbert when he was in the U.S. Navy during World War II. The Olsons came from Alexandria to have lunch with their granddaughter Audrey and her mother, who live in Sartell, along with grandson Evan Olson-Drake, a fourth-grader. 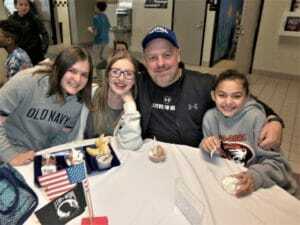 Veteran Lucas Jones enjoys ice-cream dessert with daughter Liberty (second from left), a seventh-grader at Sartell Middle School. Liberty’s friends also joined in the luncheon tribute – Allie Hubert (left) and Brodi Pflueger, both Sartell seventh-graders. The annual “Lunch with Veterans Day” served 75 veterans, their loved ones and friends.